It’s a word often used to describe our feline friends. But despite that reputation — which is not deserved — cats are one of the most popular pets. Why? Because these intelligent creatures are infinitely fascinating. Cat owners can tell you if their cats have a long list of likes — and an equally long (or longer) list of dislikes. While each cat has its preferences, some things are (nearly) universal feline favorites. Here are seven things most commonly liked by cats everywhere. Cats love sleeping and napping. It’s no secret that cats sleep a lot. In fact, the average cat sleeps for 15 to 16 hours per day, on average. 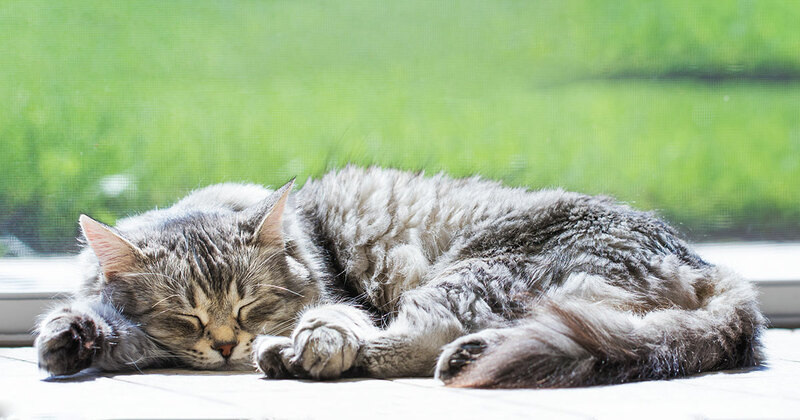 Kittens and geriatric kitties may nap as much as 20 hours daily. That’s more time than your cat spends doing anything else, including eating. If you’re concerned that your cat may be sleeping too much or too little, talk to your veterinarian about what’s normal for your kitty’s breed, age, size and activity level. Cats love grooming themselves and being groomed. Would it surprise you to learn that cats spend anywhere from two to six hours a day cleaning and conditioning their coat and claws? That’s right. Whether they’re grooming themselves, another cat or even their human, cats love to be as clean as possible. Their sandpaper-like tongues help remove dirt while dispersing skin oils throughout their coats. Cats love a clean and private bathroom space. Let’s talk litter boxes. Like us, our cats want a private, quiet and clean place to (ahem) eliminate. According to the American Association of Feline Practitioners (AAFP), cat owners should consider location, size, type of litter, litter box management and the number of litter boxes needed when choosing these all-important cat supplies. The general rule of thumb is to have one litter box per cat in the home, plus one more. They should be placed in different locations, avoiding the busy areas of your home. When it comes to litter, many cats prefer an unscented clumping litter. You may need to experiment with different litter and box combinations to find one that works for your cat. Finally, AAFP recommends removing waste from the litter boxes at least once a day, and add litter as needed. Cats love — and need — to scratch. You can train your cats to scratch certain surfaces and not others. Since each cat may prefer different scratching surfaces, you may need to offer a variety of options in different locations. Cats love high places for watching and hiding. Today’s pet cats share a common ancestor — the African wildcat (Felis sylvestris lybica). This small wildcat still exists and, like our pet cats, is both predator and prey in its natural environment. As a predator, the African wildcat evolved to hide high in trees or hills to watch for prey. And as prey, it escapes to high places where large predators can’t follow. Jumping and climbing to high places continues to be a normal behavior for our domesticated cats. Like their ancestors, your feline friends seek out high places to survey their home territory and to escape from another pet in the home, a young child or something that scares them. You can satisfy your cat’s love of high places by providing “approved” places for climbing, jumping, escaping, resting and surveying the environment. Indoor cat “tree” furniture with a variety of surfaces and comfortable platforms is an excellent alternative to your kitchen counters, bookshelves or fireplace mantels. Cats love a stimulating environment. Cats are naturally curious and need some type of challenge or entertainment every day. While living indoors keeps cats safe from predators, cars and other dangers, it can also be boring for your kitties. Like us and dogs, cats need to expend energy and use their minds to be healthy and happy. Cats need a variety of toys, including those they can play with on their own (for while you’re at work) and those that you can use to play with them. And a window perch is a great place for your kitty to nap or watch birds and squirrels. Cats are often considered to be solitary animals, probably because they hunt alone and not in packs. So would it surprise you to learn that cats prefer social interaction to food? A study done at Oregon State University showed a majority of cats prefer social interaction with people over food, which came in second. The study included pet cats and shelter cats who were given a choice between food, toys, scent and social interaction with humans. While researchers noted variation among cats, the majority of pet cats and shelter cats preferred to interact with people more than anything else.